I set out to do something about this most neglected room in our home two maybe three years ago and am finally feeling FANTASTIC about the way it’s coming along after making a bunch of regrets and having to start over twice and quitting/forgetting about it for months at a time. 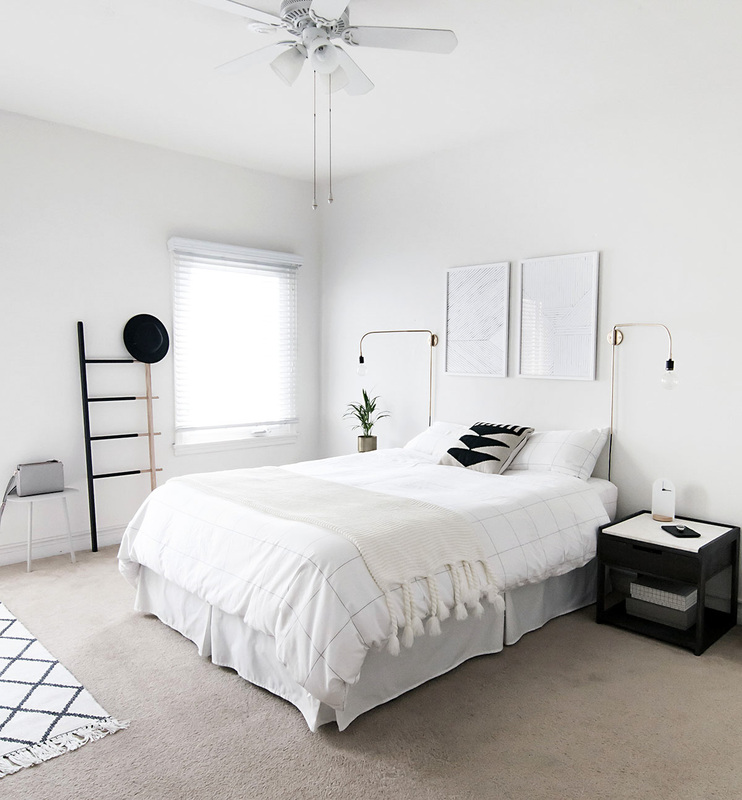 This room has gone through multiple identity crises, but with our last bedroom update on ruthlessly decluttering and reorganizing, the goal was to create a minimal yet functional space that screams relax and do nothing but also organize your stuff nicely in here without stress aah. 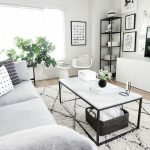 Along with keeping a mostly white palette, I stuck with a lot of elements in Scandinavian design and thought I’d share some tips with you on how to achieve that style. 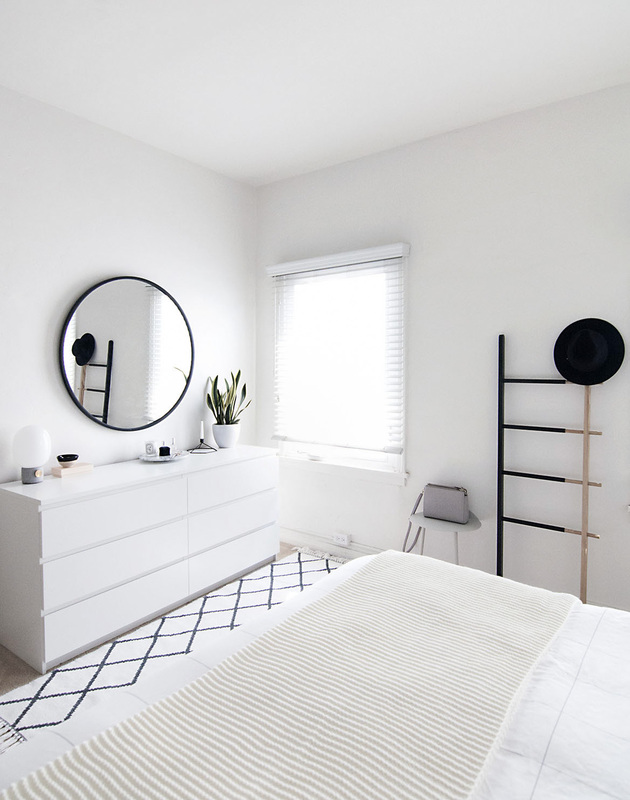 Back to what I mentioned before, having a decluttered space is the foundation for the simplicity of Scandinavian style, which can be really hard and take a long time like it did for me, but what you’re left with is a clean room filled only with things you absolutely need or find absolutely beautiful. It’s an amazing feeling that I didn’t know or think I could have, but yes it took work! 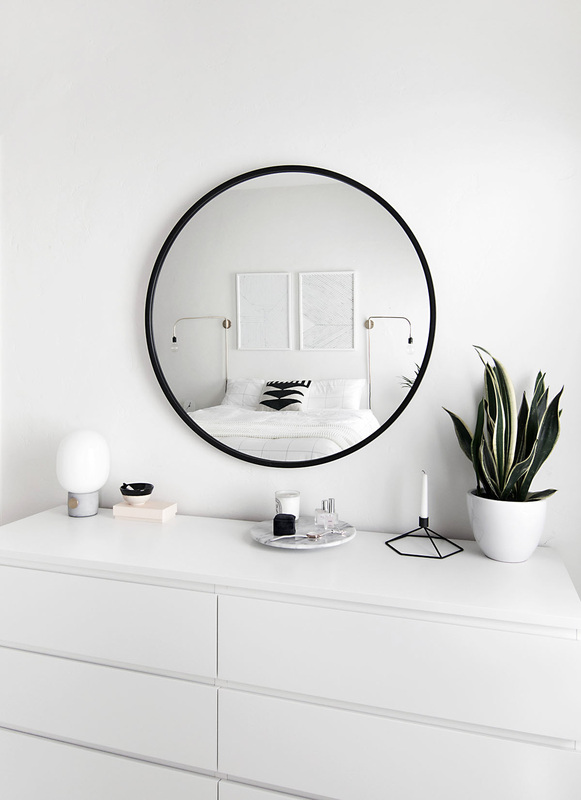 Since I only spent forever on trying these out myself, let me impart on you my five tips on how to achieve a minimal, Scandinavian interior. 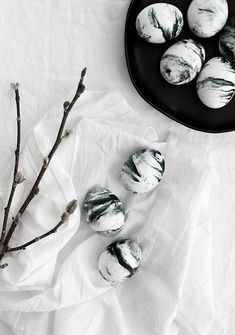 Keep colors neutral. They’re the clean slate backdrop to anything else that goes on in the room. 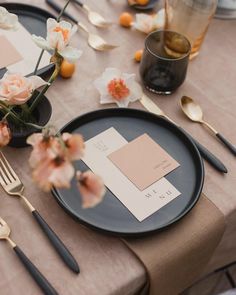 It’s ok to have color, but keep it minimal and within the same family. At one transitional point this room had green, blue, and red going on, which isn’t “wrong” but it was very loud and chaotic. 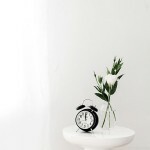 You are likely more than fully aware of my love story with black and white, which happens to be the combo I find most calming and fresh, so no question they would be the main players in our bedroom and on second thought is what’s going on in our entire home anyway. 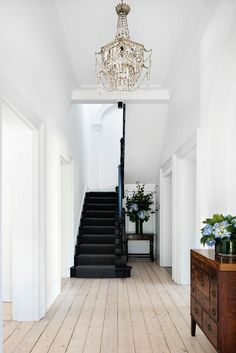 White is the big guy in here and makes the room feel even more airy and spacious, which was definitely a big goal. 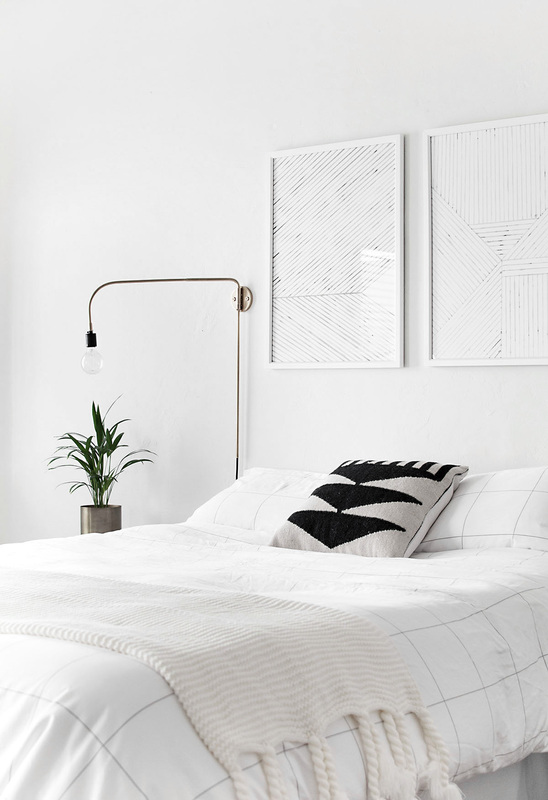 Stick with simple shapes and straight lines for furniture, decor, or patterns. 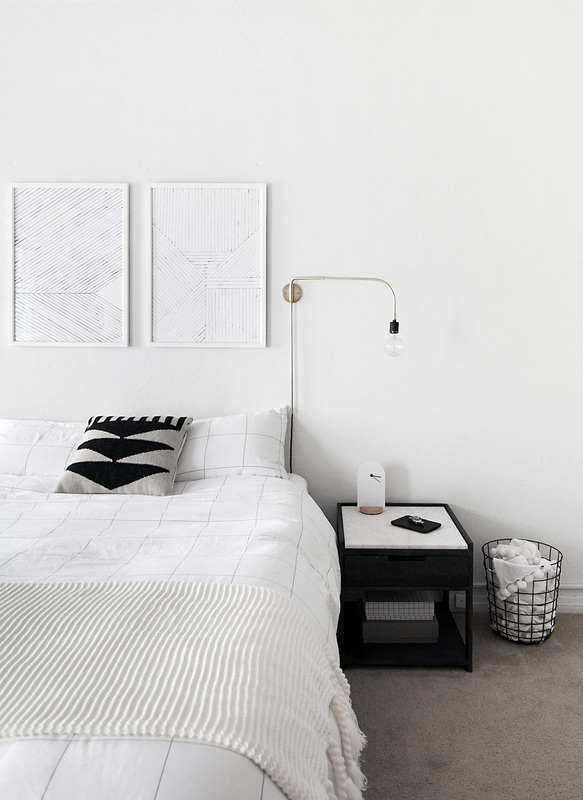 The grid pattern on the bedding and basket, the sleek lines of the wall sconces, the simple patterns in the art on the left and right, the straight lines of his bedside table, I’m ALL about those clean lines. Fun story, I asked O to style his bedside table to stay true to how he’d keep it, and minus the wallet I tossed inside his drawer because of course I intervened, this is what he came up with. It’s been under my nose this whole time: he’s such a minimalist, ha! Or just a guy, that’s probably more of it. Even all the decluttering that was done for this room was 99% my stuff, he was already living only with essentials. I’ve wanted to be like him all along, who knew. 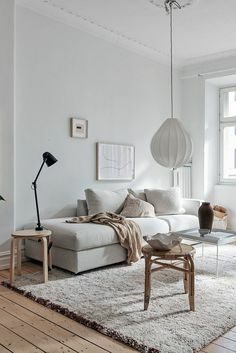 An entirely neutral palette stays interesting with texture, which can also add warmth to the typically cool toned neutrals found in Scandi interiors. The wool pillow, sea grass basket, and knit throw are a few of my favorite factors at play here. 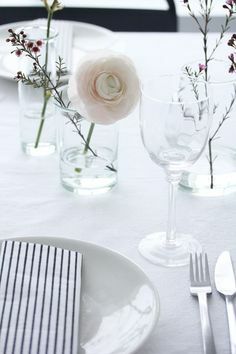 Plants are my favorite way to bring nature in and they also add color while still keeping the overall palette neutral. Wood is a really good way to do this as well, adding both to warming up the room and providing a little more texture. 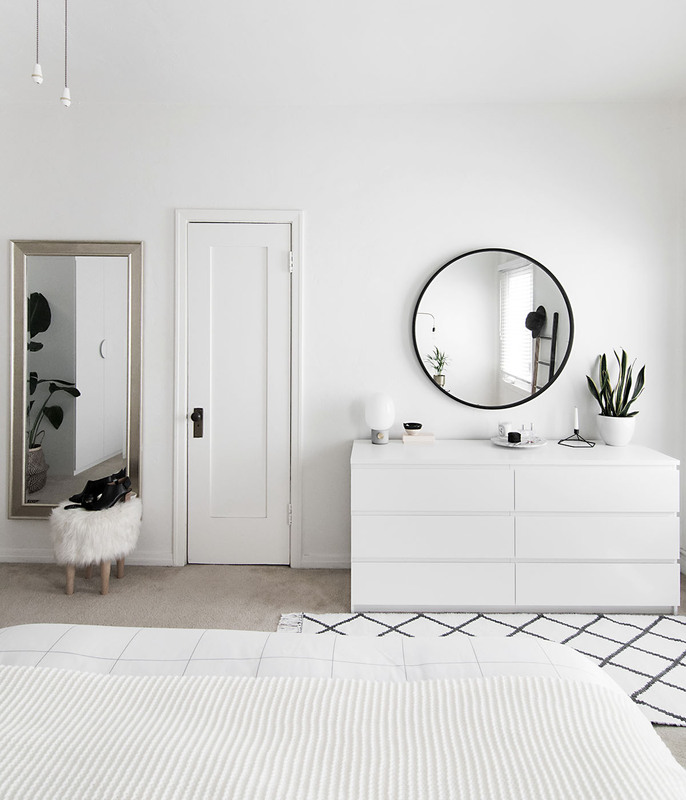 The way to keep up the simplicity of a Scandinavian interior is when function is present alongside the design, that way space is used efficiently and spaciousness can be maintained. 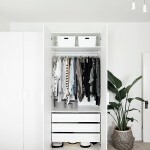 The highest functional value in our bedroom is definitely the external wardrobes. I love how they essentially look like an extension of the wall and of course that they store a lot of our clothes and belongings. The closet that came with the room was way too small for us to share so these wardrobes are basically making living here possible. I use the ladder to plan and hang up my outfit for the next day, and I use the low gray table as a sort of catch all at the end of the day to throw my stuff on, usually my purse. This has been working out exceptionally well for me since prior to having this spot I’d not know where my purse was on a daily basis. No more! Our dresser also holds a lot of our clothes and unlike the wardrobe allows for display of pretty things on top, like my baby concrete lamp, the candelabra, or my favorite mirror of all time. The basket by my bedside is something I didn’t know how I’d use until I put it there. I wear a set of PJs for a few nights at a time and used to either throw them on the bed or throw them on the floor because I didn’t want to fold them back up into the dresser. Something as simple as having a cute basket to hold them in between wearings has given me so much peace of mind. While I don’t need a drawer for my nightstand, O does since it practically doubles as his desk for small/short tasks, hence our mismatching bedside tables. I tell ya, he already had the minimalism thing down before I tried to overhaul the bedroom. Part of what took so long to get here was not knowing how long we would be staying. We had lofty plans for a while of moving to a house, so we tried reasoning that there was no need to put too much effort into “finishing” the bedroom soon. That state of limbo makes it hard to feel at home and results in feeling anxious pretty much all the time, at least for me it did. 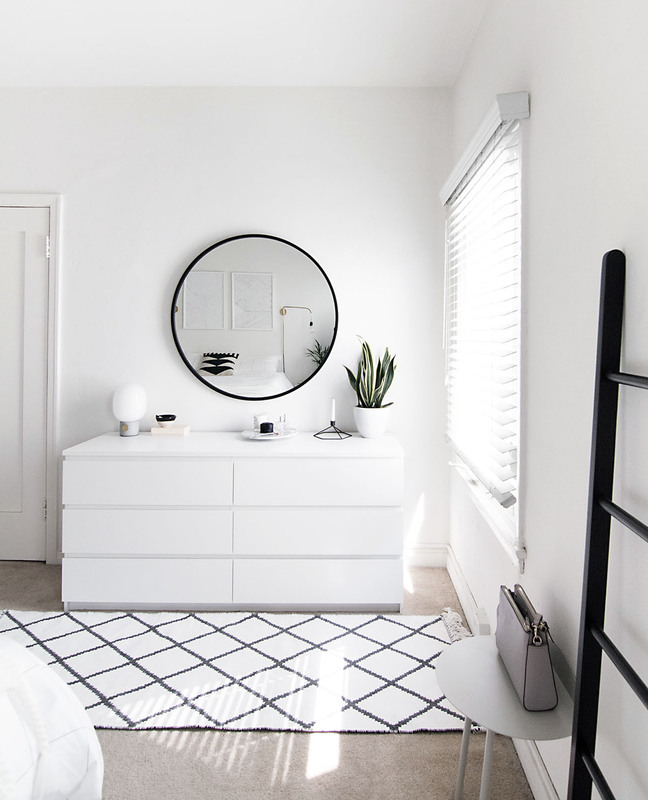 Once officially deciding we’d be staying here a while, I felt a ton of relief, and this bedroom was such a huge win for positively changing how we feel about staying. Like everything, I’m not calling this room done yet, though with this room there are specifics I wanted to complete but didn’t, mainly the bed! 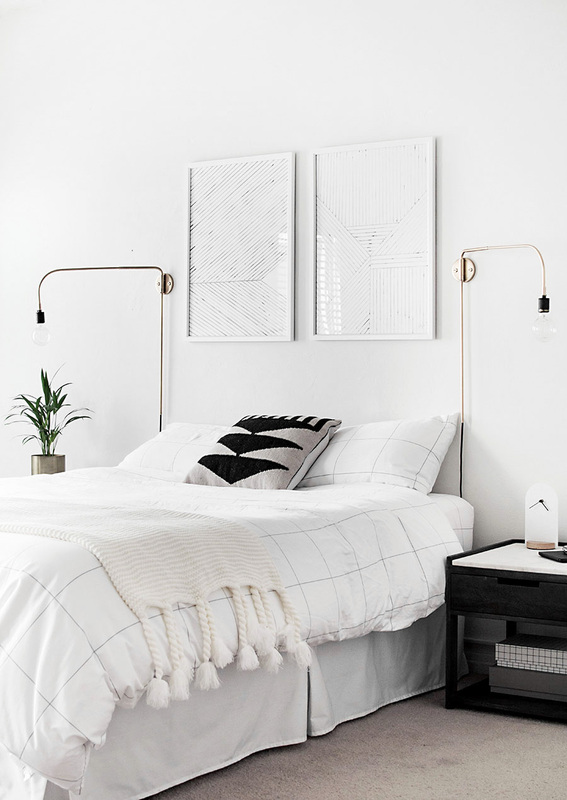 I actually hung up the art and sconces in anticipation of getting a bed with headboard, then changed my mind and didn’t get it, oops. 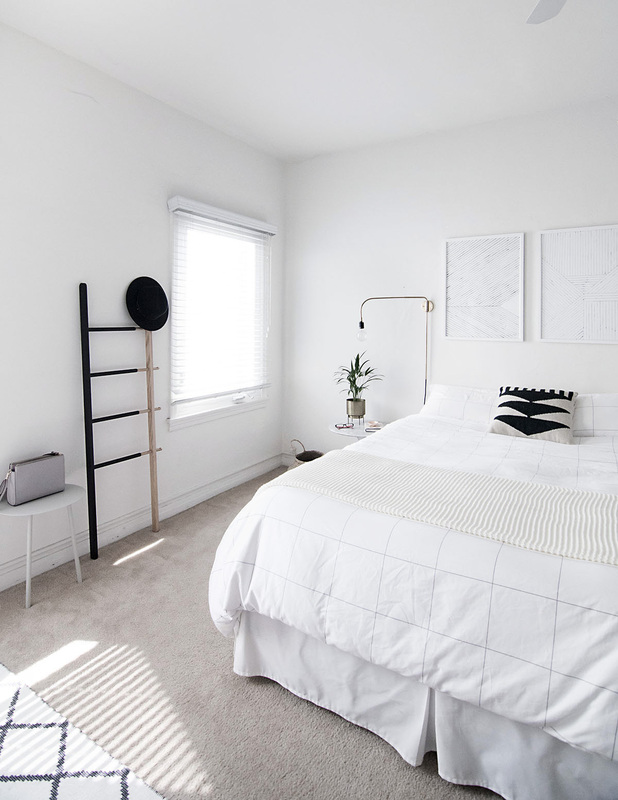 Still holding out for a well priced low profile white upholstered bed (know anything?) but also holding out for my changing moods that might obsess over something else or want to continue keeping what we have now, who knows. 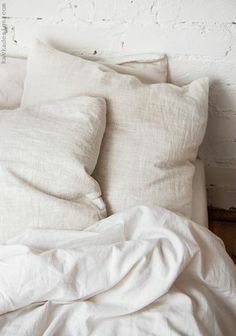 I definitely want to play around more with bedding this upcoming season- I read somewhere that bed linens should be completely replaced once a year… I don’t think I’ll ever strictly follow that, but it made me think because some of ours are wayyyyyy past that timeline. Do you follow that timeline?? 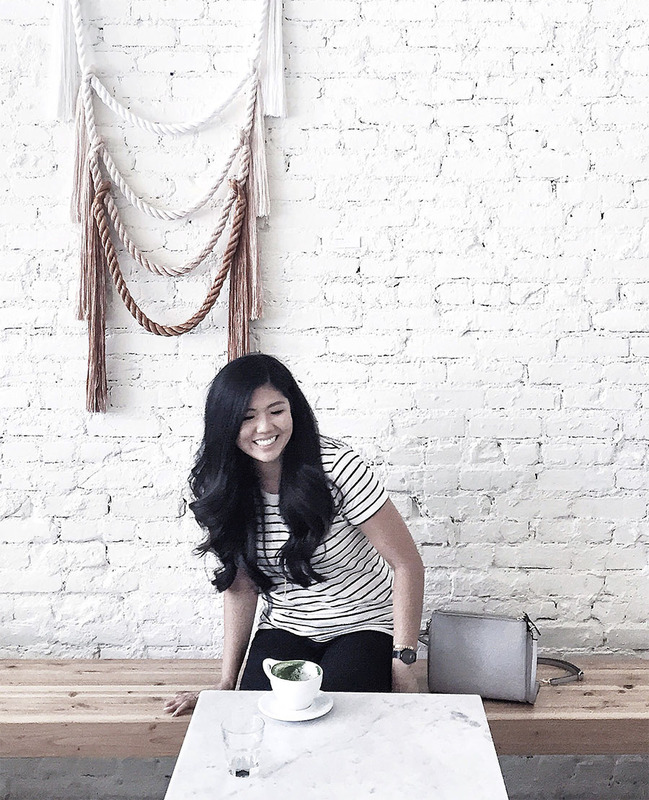 Plus, any styling tips you’d like to add to this post? Leave them below in the comments! Thanks, Abigail! I feel like it took me all 29 years of my life to learn how to declutter. It’s always been one of my biggest challenges so let me be corny and say that if I can, you for real absolutely without a doubt can too! Your room turned out beautifully Amy!! 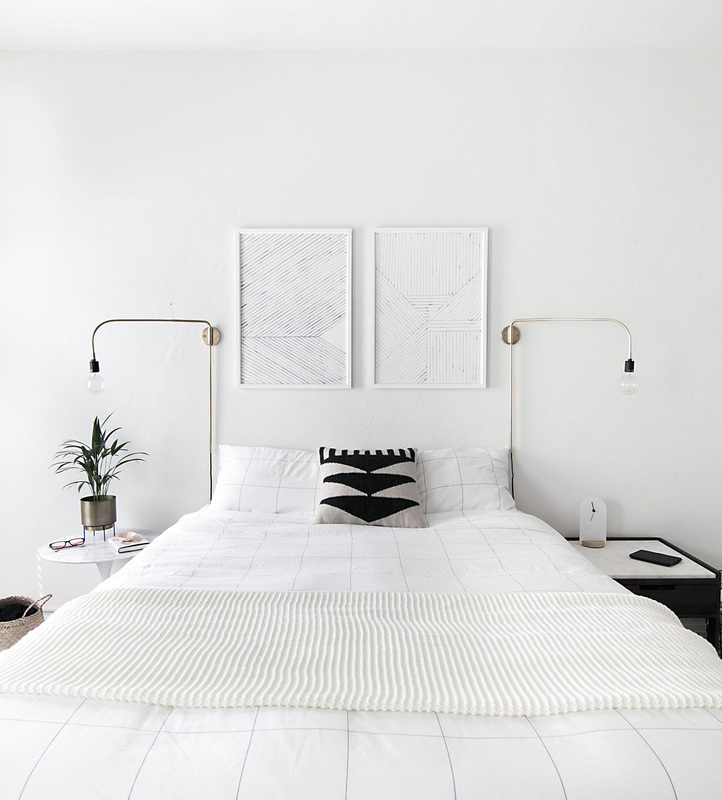 I’m so in love with the minimal scandinavian style, so your tips are perfect for me! I’m totally pinning this as inspiration! My fiance and I are currently redecorating our room and I’ve been referring to your blog for inspiration. 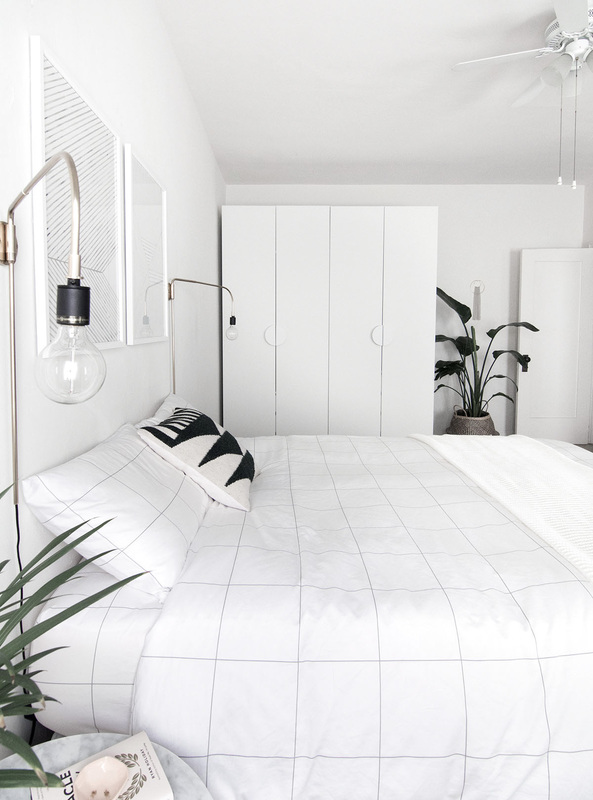 Your bedroom is just perfect. We too are having a difficult time finding the perfect bed frame. How is engaged life?? That engaged life is great. Hardly making progress on that wedding though… haven’t picked a venue yet and mostly have been looking at dresses, but otherwise I’d be fine if we were engaged forever :) Congrats on your engagement! 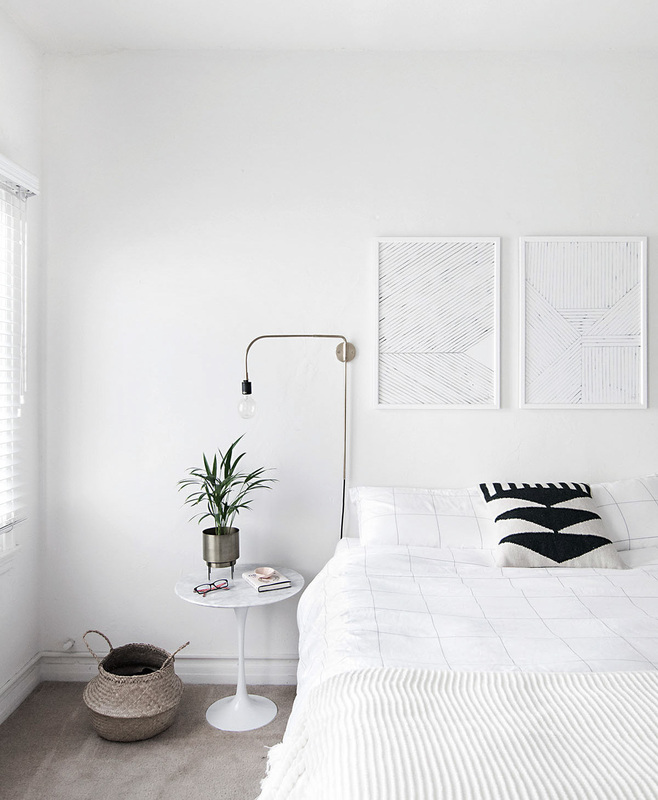 Love your space and how simplistic it looks! It looks so modern and clutter free. Great work! 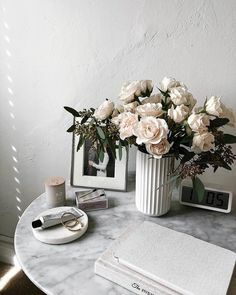 I seriously love your bedside table! I’ve also been eyeing a lot of Umbra and Menu products for a while now too. But that basket for your pajamas is genius! Pajamas in baskets needs to happen. Thank you, Elysia! I love your minimalist style! 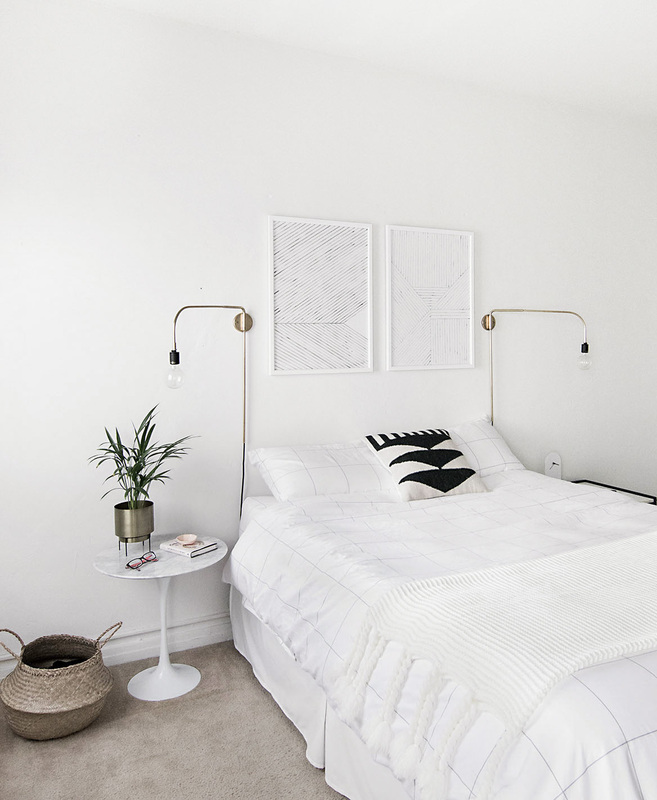 The bright whites make it look so comfortable and I REALLY love those sconces! Lovely room! Love how relaxing it is! And what color white did you use on the walls? I’m pretty sure it’s all the same! While the walls are a flat/matte finish, I think the trim is glossier, but I barely see a difference. 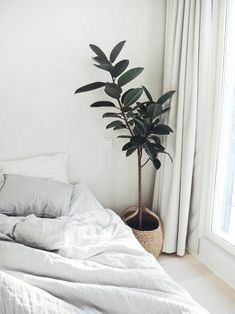 Such a lovely bedroom! 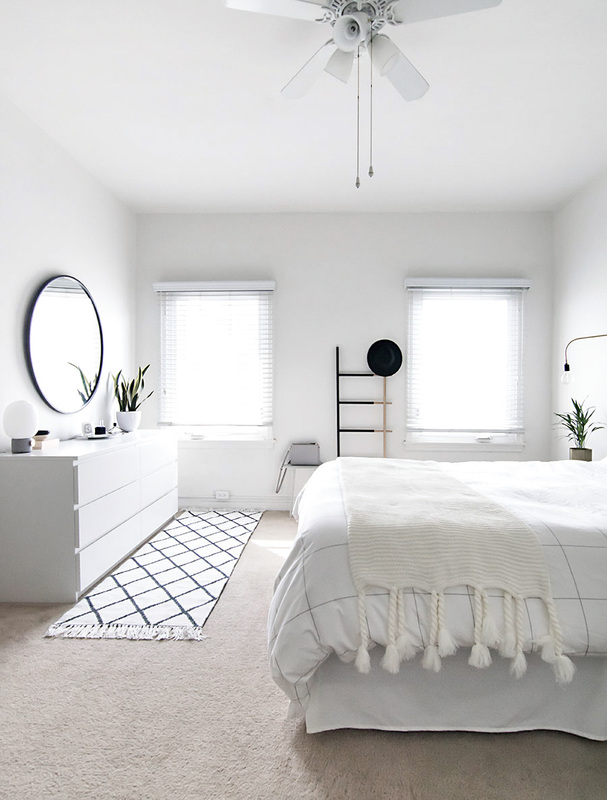 I love how fresh, minimal and clean it is! To be honest, I’m always trying to declutter. One day I’m manage to have a bedroom like this! 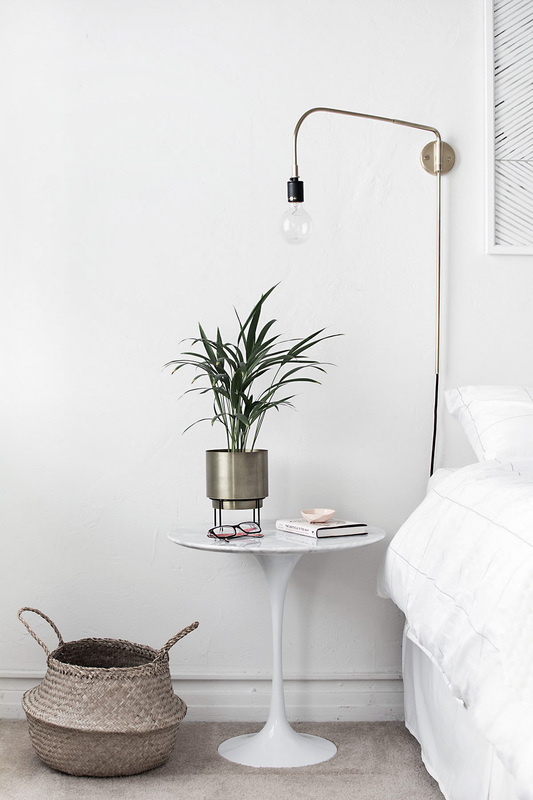 I love the scandinavian style – I’m from DK, so I guess it makes perfectly sense. It’s so fresh and clean. 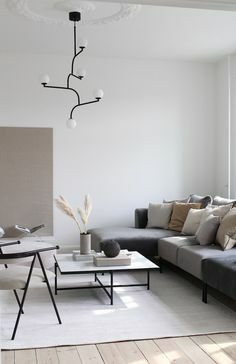 Love this space, it’s so gorgeous! Thanks so much, Emma! I DREAM of visiting DK one day. I follow you from time to time when you do a project for Michaels’ Makers. I like your room and mine is almost there as I’ve been reading & re-reading Marie Kondo;s two books. Perhaps you need to plan a honeymoon to DK? Copenhagen is lovely and so is the island of Fyn, where Hans Christian Anderson is from. Spend a couple of days in each area and if you’re a lego fan or your better half is then make your way to the third area of DK and go to Billund, home of Legoland #1. Truly a beautiful country in May, with all the flowers in bloom. I understand what you mean. That limbo feeling of “we’re moving so don’t invest” is the worst. My husband and I finally moved someplace we’re staying for awhile and now it’s like “don’t spend all your money now.” Because we’re so eager to do everything! Yea I think no matter what the situation my fiance always sides with don’t spend money on anything haha! Can’t deny though that having a space you love and are proud of makes an immense positive impact on happiness. It’s worth the effort for sure, and as long as everything is something you ridiculously love, it will stay with you in the long run <3. 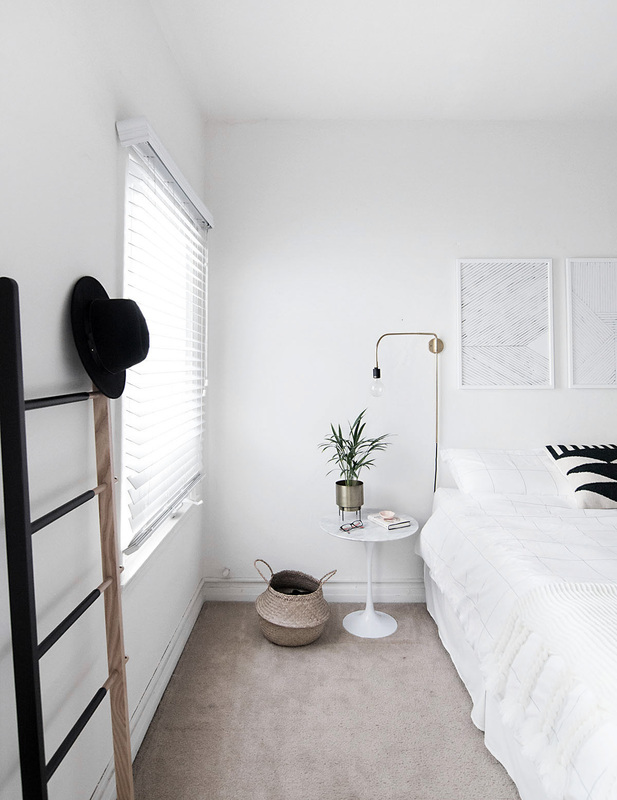 Your’e speaking my love language with this minimal space. I love the prints above your bed. Do you mind sharing the source? 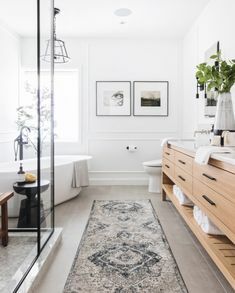 You have done such a lovely job with this room! Oh that’s so great to hear about your dorm room! I’m all for black and white, I think you already know this ;) Thanks for sharing, Heather! Truly Beautiful! I absolutely lvoe the big mirror!!! Thanks for sharing the link! !